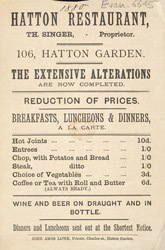 The restaurant as we commonly know it did not really develop in Britain until the end of the 19th century. Even then, the word restaurant was used to describe a place that served foreign cuisine, thus distinguishing it from the public dining rooms in which most of the working and middle classes ate. The interiors of these restaurants were usually sumptuosly decorated, with beautiful carvings and heavy curtains. Plants were a common feature, with flowers arranged on every table.